For other uses, see Dutch (disambiguation). Dutch ( Nederlands (help·info)) is a West Germanic language spoken by around 23 million people as a first language and 5 million people as a second language, constituting the majority of people in the Netherlands (where it is the sole official language) and Belgium (as one of three official languages). It is the third most widely spoken Germanic language, after its close relatives English and German. Dutch is one of the closest relatives of both German and English[n 5] and is colloquially said to be "roughly in between" them. [n 6] Dutch, like English, has not undergone the High German consonant shift, does not use Germanic umlaut as a grammatical marker, has largely abandoned the use of the subjunctive, and has levelled much of its morphology, including most of its case system. [n 7] Features shared with German include the survival of two to three grammatical genders—albeit with few grammatical consequences[n 8]—as well as the use of modal particles, final-obstruent devoicing, and a similar word order. [n 9] Dutch vocabulary is mostly Germanic and incorporates slightly more Romance loans than German but far fewer than English. [n 10] As with German, the vocabulary of Dutch also has strong similarities with the continental Scandinavian languages, but is not mutually intelligible in text or speech with any of them. In both Belgium and the Netherlands, the native official name for Dutch is Nederlands. Sometimes Vlaams ("Flemish") is used as well to describe Standard Dutch in Flanders. Over time, the Dutch language has been known under a variety of names. In Middle Dutch Dietsc, Duutsc, or Duitsc was used. It derived from the Old Germanic word theudisk, which literally means "popular" or "belonging to the populace". In Western Europe this term was used for the language of the local Germanic populace as opposed to Latin, the non-native language of writing and the Catholic Church. In the first text in which it is found, dating from 784, theodisce refers to Anglo-Saxon, the West Germanic dialects of Britain. Although in Britain the name Englisc replaced theodisce early on, speakers of West Germanic in other parts of Europe continued to use theodisce to refer to their local speech. With the rise of local powers in the Low Countries during the Middle Ages, language names derived from these local polities came in use as well i.e.Vlaemsch, Hollandsch, and Brabantsch. The more powerful the local polity, the wider the use of its name for the language became. These names still survive in the corresponding dialect groups spoken today. Owing to commercial and colonial rivalry in the 16th and 17th centuries between England and the Low Countries, a cognate of theodisk (most likely Middle Dutch Duutsc) was borrowed into English and developed into the exonym Dutch, which came to refer exclusively to the people of the Netherlands. (A usage of the English term Dutch that includes German survives in the United States in the name Pennsylvania Dutch for a local German dialect and its speakers, commonly believed to be a corruption of their endonym Deitsch.) In the Low Countries on the contrary, Dietsch or Duytsch as endonym for Dutch went out of common use and was gradually replaced by the Dutch endonym Nederlands. This designation started at the Burgundian court in the 15th century, although the use of neder, laag, bas, and inferior ("nether" or "low") to refer to the area known as the Low Counties goes back further in time. The Romans referred to the region as Germania Inferior ("Lower" Germania). It is a reference to the Low Countries' downriver location at the Rhine–Meuse–Scheldt delta near the North Sea. From 1551 the designation Nederlands received strong competition from the name Nederduits ("Low Dutch;" Dutch is used here in its archaic sense that covers all continental West Germanic languages). It is a calque of the aforementioned Roman province Germania Inferior and an attempt by early Dutch grammarians to give their language more prestige by linking it to Roman times. Likewise, Hoogduits ("High Dutch") came into use as a Dutch exonym for the German language, spoken in neighboring German states. However, 19th century Germany saw the rise of the categorisation of dialects, and German dialectologists termed the German dialects spoken in the mountainous south of Germany as Hochdeutsch ("High German"). Subsequently, German dialects spoken in the north were designated as Niederdeutsch ("Low German"). The names for these dialects were calqued in the Dutch language area as the exonyms Nederduits and Hoogduits. As a result, Nederduits no longer served as a synonym for the Dutch language, and Nederlands prevailed as sole Dutch endonym. It also meant that Hoog ("High") had to be dropped in one of the two meanings of Hoogduits, leading to the narrowing down of Duits as Dutch exonym for the German language, and Hoogduits as reference for southern German dialects. Among the Indo-European languages, Dutch is grouped within the Germanic languages, meaning it shares a common ancestor with languages such as English, German, and the Scandinavian languages. All Germanic languages are subject to the Grimm's law and Verner's law sound shifts, which originated in the Proto-Germanic language and define the basic features differentiating them from other Indo-European languages. This is assumed to have taken place in approximately the mid-first millennium BCE in the pre-Roman Northern European Iron Age. The Germanic languages are traditionally divided into three groups: East (now extinct), West, and North Germanic. They remained mutually intelligible throughout the Migration Period. Dutch is part of the West Germanic group, which also includes English, Scots, Frisian, Low German (Old Saxon) and High German. It is characterized by a number of phonological and morphological innovations not found in North or East Germanic. 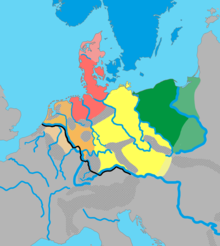 The West Germanic varieties of the time are generally split into three dialect groups: Ingvaeonic (North Sea Germanic), Istvaeonic (Weser-Rhine Germanic) and Irminonic (Elbe Germanic). It appears that the Frankish tribes fit primarily into the Istvaeonic dialect group with certain Ingvaeonic influences towards the northwest, which are still seen in modern Dutch. The Frankish language itself is poorly attested. A notable exception is the Bergakker inscription, found near the Dutch city of Tiel, which may represent a primary record of 5th-century Frankish. Although some place names recorded in Roman texts such as vadam (modern Dutch: wad, English: "mudflat"), could arguably be considered as the oldest single "Dutch" words, the Bergakker inscription yields the oldest evidence of Dutch morphology. However, there is no consensus on the interpretation of the rest of the text. The Franks emerged in the southern Netherlands (Salian Franks) and central Germany (Ripuarian Franks), and later descended into Gaul. The name of their kingdom survives in that of France. Although they ruled the Gallo-Romans for nearly 300 years, their language, Frankish, became extinct in most of France and was replaced by later forms of the language throughout Luxembourg and Germany in around the 7th century. It was replaced in France by Old French (a Romance language with a considerable Old Frankish influence). However, the Old Franconian language did not die out at large, as it continued to be spoken in the Low Countries, and subsequently evolved into what is now called Old Low Franconian or Old Dutch in the Low Countries. In fact, Old Frankish could be reconstructed from Old Dutch and Frankish loanwords in Old French. Old Low Franconian or Old Dutch is regarded as the prime ancestor of a separate Dutch language. The "Low" in Old Low Franconian refers to the Low Countries, where Frankish was only minimally influenced by the High German consonant shift and the Ingvaeonic nasal spirant law. The High German consonant shift, moving over Western Europe from south to west, caused a differentiation with the Central and High Franconian in Germany. The latter would as a consequence evolve (along with Alemannic, Bavarian and Lombardic) into Old High German. At more or less the same time the Ingvaeonic nasal spirant law, moving over Western Europe from west to east, led to the development of Old English (or Anglo-Saxon), Old Frisian and Old Saxon. Hardly influenced by either development, Old Dutch remained close to the original language of the Franks, the people that would rule Europe for centuries. The language did however experience developments of its own, such as very early final-obstruent devoicing. In fact, the find at Bergakker indicates that the language may already have experienced this shift during the Old Frankish period. Attestations of Old Dutch sentences are extremely rare. The language is mostly recorded on fragmentary relics, and words have been reconstructed from Middle Dutch and loan words from Old Dutch in other languages. The oldest recorded is found in the Salic law. In this Frankish document written around 510 the oldest Dutch sentence has been identified: Maltho thi afrio lito ("I say to you, I free you, serf") used to free a serf. Another old fragment of Dutch is Visc flot aftar themo uuatare ("A fish was swimming in the water"). The oldest conserved larger Dutch text is the Utrecht baptismal vow (776–800) starting with Forsachistu diobolae ... ec forsacho diabolae ("Do you forsake the devil? ... I forsake the devil"). If only for its poetic content, the most famous Old Dutch sentence is probably Hebban olla vogala nestas hagunnan, hinase hic enda tu, wat unbidan we nu ("All birds have started making nests, except me and you, what are we waiting for"), is dated to around the year 1100, written by a Flemish monk in a convent in Rochester, England. Since the sentence speaks to the imagination, it is often erroneously stated as the oldest Dutch sentence. Old Dutch naturally evolved into Middle Dutch. The year 1150 is often cited as the time of the discontinuity, but it actually marks a time of profuse Dutch writing and during this period a rich Medieval Dutch literature developed. There was at that time no overarching standard language; Middle Dutch is rather a collective name for a number of closely related mutually intelligible dialects whose ancestor was Old Dutch. Where Old Dutch fragments are very hard to read for untrained Modern Dutch speakers, the various literary works of Middle Dutch are somewhat more accessible. The most notable difference between Old and Middle Dutch is in a feature of speech known as vowel reduction. Round vowels in word-final syllables are rather frequent in Old Dutch; in Middle Dutch, such vowels are leveled to a schwa. West Flemish with the County of Flanders at its centre. It had been influential during the earlier Middle Ages (the "Flemish expansion") but lost prestige to the neighbouring Brabantian in the 13th century. Brabantian (and related East Flemish), spoken primarily in the Duchy of Brabant and adjacent parts. It was an influential dialect during most of the Middle Ages, during the so-called "Brabantian expansion" in which the influence of Brabant was extended outwards into other areas. Hollandic, which had the County of Holland as its heartland, where originally Old Frisian was spoken. The people mixed with Frankish settlers from Flanders and Brabant and a new Frankish dialect with a Frisian substrate developed. It was less influential during most of the Middle Ages but became more so in the 16th century during the "Hollandic expansion"; the Eighty Years' War took place in the Southern Netherlands during this period. Limburgish, spoken by the people in the modern-day provinces of Dutch and Belgian Limburg, and adjacent lands in Germany. It was over time tied to different political areas and is therefore the most divergent of the dialects. It was even partly influenced by the High German consonant shift and is the most distant to the later developed standard language to which it contributed little. It was however the earliest Middle Dutch dialect that developed a literary tradition. Since it has Old Saxon and not Low Franconian (Old Dutch) as its ancestor, Dutch Low Saxon is not strictly a Dutch dialect. However, it was influenced by Middle Dutch since the 14th century and it did play a part in the formation of the standard Dutch language in later periods. It was spoken in the Oversticht territories of the episcopal principality of Utrecht and adjacent parts of Guelders. A process of standardisation started in the Middle Ages, especially under the influence of the Burgundian Ducal Court in Dijon (Brussels after 1477). The dialects of Flanders and Brabant were the most influential around this time. The process of standardisation became much stronger at the start of the 16th century, mainly based on the urban dialect of Antwerp. The 1585 fall of Antwerp to the Spanish army led to a flight to the northern Netherlands, where the Dutch Republic declared its independence from Spain. This influenced the urban dialects of the province of County of Holland. 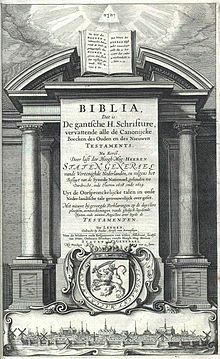 In 1637, a further important step was made towards a unified language, when the Statenvertaling, the first major Bible translation into Dutch, was created that people from all over the new republic could understand. It used elements from various, even Dutch Low Saxon, dialects but was predominantly based on the urban dialects of Holland of post 16th century. In the Southern Netherlands (now Belgium and Luxembourg), developments were different. Under subsequent Spanish, Austrian and French rule, the standardisation of Dutch language came to a standstill. The state, law, and increasingly education used French, yet more than half the Belgian population were speaking a variety of Dutch. In the course of the nineteenth century the Flemish Movement stood up for the rights of Dutch speakers, mostly which were referred to as "Flemish". However, the dialect variation was a serious disadvantage in the face of the standardised francophonie. Since standardisation is a lengthy process, Dutch-speaking Belgium associated itself with the standard language that had already developed in the Netherlands over the centuries. Therefore, the situation in Belgium is essentially no different from that in the Netherlands, although there are recognisable differences in pronunciation, comparable to the pronunciation differences between standard British and standard American English. In 1980 the Netherlands and Belgium concluded the Language Union Treaty. This treaty lays down the principle that the two countries must gear their language policy to each other, among other things, for a common system of spelling. Dutch belongs to its own West Germanic sub-group, the Low Franconian languages, paired with its sister language Limburgish or East Low Franconian. Its closest relative is the mutually intelligible daughter language, Afrikaans. Other West Germanic languages related to Dutch are German, English and the Frisian languages and the un-standardised languages Low German and Yiddish. Dutch stands out in combining some Ingvaeonic characteristics (occurring consistently in English and Frisian and reduced in intensity from west to east over the continental West Germanic plane) with dominant Istvaeonic characteristics, of which some of them are also incorporated in German. Unlike German, Dutch (apart from Limburgish) has not been influenced at all by the south to north movement of the High German consonant shift and had some changes of its own. The cumulation of these changes resulted over time in separate, but related standard languages with various degrees of similarities and differences between them. For a comparison between the West Germanic languages, see the sections Morphology, Grammar and Vocabulary. Dutch dialects are primarily the dialects that are both related with the Dutch language and are spoken in the same language area as the Dutch standard language. Although heavily under the influence of the standard language, some of them remain remarkably diverse and are found in the Netherlands and northern Belgium. The areas in which they are spoken often correspond with former mediaeval counties and duchies. The Netherlands (but not Belgium) distinguishes between a dialect and a streektaal ("regional language"). Those words are actually more political than linguistic because a regional language unites a large group of very different varieties. Such is the case with the Gronings dialect, which is considered a variety of the Dutch Low Saxon regional language, but it is really very distinct from other Low Saxon varieties because of a Frisian substrate. Also, some Dutch dialects are more remote from the Dutch standard language than some varieties of a regional language are. Such is the case with West Flemish, which is considered a Dutch dialect but is far more remote from the standard language than most Dutch Low Saxon varieties are. Within the Netherlands, a further distinction is made between a regional language and a separate language, which is the case with the (standardised) West Frisian language. It is spoken alongside Dutch in the province of Friesland. Dutch dialects and regional languages are not spoken as often as they used to be, especially in the Netherlands. Recent research by Geert Driessen shows that the use of dialects and regional languages among both Dutch adults and youth is in heavy decline. In 1995, 27 percent of the Dutch adult population spoke a dialect or regional language on a regular basis, but in 2011, that was no more than 11 percent. In 1995, 12 percent of children of primary school age spoke a dialect or regional language, but in 2011, that had declined to 4 percent. Of the officially recognized regional languages Limburgish is spoken the most (in 2011 among adults 54%, among children 31%) and Dutch Low Saxon the least (adults 15%, children 1%). The decline of the West Frisian language in Friesland occupies a middle position (adults 44%, children 22%). Dialects are most often spoken in rural areas, but many cities have a distinct city dialect. For example, the city of Ghent has very distinct "g", "e" and "r" sounds that greatly differ from its surrounding villages. The Brussels dialect combines Brabantian with words adopted from Walloon and French. Some dialects had, until recently, extensions across the borders of other standard language areas. In most cases, the heavy influence of the standard language has broken the dialect continuum. Examples are the Gronings dialect spoken in Groningen as well as the closely related varieties in adjacent East Frisia (Germany). South Guelderish (Zuid-Gelders) is a dialect spoken in southern Gelderland, the northern tip of Limburg, and northeast of North Brabant (Netherlands), but also in adjacent parts of North Rhine-Westphalia (Germany). Limburgish (Limburgs) is spoken in Limburg (Belgium) as well as in the remaining part of Limburg (Netherlands) and extends across the German border. 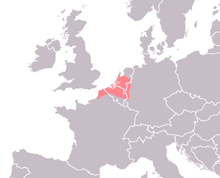 West Flemish (Westvlaams) is spoken in West Flanders, the western part of Zeelandic Flanders and also in French Flanders, where it virtually became extinct to make way for French. 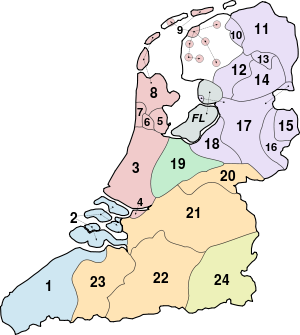 The blank area (near zone 9) speaks West Frisian, a separate language. The West Flemish group of dialects, spoken in West Flanders and Zeeland, is so distinct that it might be considered as a separate language variant, although the strong significance of language in Belgian politics would prevent the government from classifying them as such. An oddity of the dialect is that, the voiced velar fricative (written as "g" in Dutch) shifts to a voiced glottal fricative (written as "h" in Dutch), while the letter "h" becomes mute (just like in French). As a result, when West Flemings try to talk Standard Dutch, they're often unable to pronounce the g-sound, and pronounce it similar to the h-sound. This leaves, for example, no difference between "held" (hero) and "geld" (money). Or in some cases, they are aware of the problem, and hyper-correct the "h" into a voiced velar fricative or g-sound, again leaving no difference. The West Flemish variety historically spoken in adjacent parts in France is sometimes called French Flemish and is listed as a French minority language, however only a very small and aging minority of the French-Flemish population still speaks and understands West Flemish. Hollandic is spoken in Holland and Utrecht, though the original forms of this dialect (which were heavily influenced by a West Frisian substratum and, from the 16th century on, by Brabantian dialects) are now relatively rare. The urban dialects of the Randstad, which are Hollandic dialects, do not diverge from standard Dutch very much, but there is a clear difference between the city dialects of Rotterdam, The Hague, Amsterdam and Utrecht. In some rural Hollandic areas more authentic Hollandic dialects are still being used, especially north of Amsterdam. Another group of dialects based on Hollandic is that spoken in the cities and larger towns of Friesland, where it partially displaced West Frisian in the 16th century and is known as Stadsfries ("Urban Frisian"). Brabantian is named after the historical Duchy of Brabant, which corresponded mainly to the provinces of North Brabant and southern Gelderland, the Belgian provinces of Antwerp and Flemish Brabant, as well as Brussels (where its native speakers have become a minority) and the province of Walloon Brabant. Brabantian expands into small parts in the west of Limburg while its strong influence on the East Flemish of East Flanders and eastern Zeelandic Flanders weakens towards the west. In a small area in the northwest of North Brabant (Willemstad), Hollandic is spoken. Conventionally, the South Guelderish dialects are distinguished from Brabantian, but there are no objective criteria apart from geography to do so. Over 5 million people live in an area with some form of Brabantian being the predominant colloquial language out of the area's 22 million Dutch-speakers. Limburgish, spoken in both Belgian Limburg and Netherlands Limburg and in adjacent parts in Germany, is considered as a dialect in Belgium, while having obtained the status of official regional language in the Netherlands. The Dutch Low Saxon dialect area, comprising the provinces of Groningen, Drenthe and Overijssel, and parts of the province of Gelderland as well. The IJssel roughly forms the linguistic watershed here. This group, which is not Low Franconian but instead Low Saxon and close to neighbouring Low German, has been elevated by the Netherlands (and by Germany) to the legal status of streektaal (regional language) according to the European Charter for Regional or Minority Languages. It is regarded as Dutch for a number of reasons. From the 14th to 15th century onward, its urban centers (Deventer, Zwolle, Kampen, Zutphen and Doesburg) have been increasingly influenced by the western written Dutch and became a linguistically mixed area. From the 17th century onward, it was gradually integrated into the Dutch language area. Dutch Low Saxon used to be at one end of the Low German dialect continuum. However, the national border has given way to dialect boundaries coinciding with a political border, because the traditional dialects are strongly influenced by the national standard varieties. Cross-the-border dialects now separated by a plain gap also include South Guelderish and Limburgish on the Dutch side of the border and Meuse-Rhenish on the German side of the border. Limburgish has the status of official regional language (or streektaal) in the Netherlands and Germany, but not in Belgium. It receives protection by chapter 2 of the European Charter for Regional or Minority Languages. Limburgish has been influenced by the Ripuarian varieties like the Colognian dialect, and has had a somewhat different development since the late Middle Ages. Afrikaans, although to a significant degree mutually intelligible with Dutch, is not a dialect but a separate standardised language. It is spoken in South Africa and Namibia. As a daughter language of Dutch, Afrikaans evolved mainly from 17th century Dutch dialects, but was influenced by various other languages in South Africa. West Frisian (Westerlauwers Fries), along with Saterland Frisian and North Frisian, evolved from the same branch of the West Germanic languages as Old English (i.e. Anglo-Frisian) and are therefore genetically more closely related to English and Scots than to Dutch. The different influences on the respective languages, however, particularly that of Norman French on English and Dutch on West Frisian, have rendered English quite distinct from West Frisian, and West Frisian less distinct from Dutch than from English. Although under heavy influence of the Dutch standard language, it is not mutually intelligible with Dutch and considered a sister language of Dutch, like English and German. Dutch is an official language of the Netherlands proper, Belgium, Suriname, the Dutch Caribbean municipal (St. Eustatius Saba & Bonaire), Aruba, Curaçao and Sint Maarten. Dutch is also an official language of several international organisations, such as the European Union, Union of South American Nations and the Caribbean Community. At an academic level, Dutch is taught in about 175 universities in 40 countries. About 15,000 students worldwide study Dutch at university. In Europe, Dutch is the majority language in the Netherlands (96%) and Belgium (59%) as well as a minority language in Germany and northern France's French Flanders, where it is in the ultimate stage of language death. Though Belgium as a whole is multilingual, the four language areas into which the country is divided (Flanders, francophone Wallonia, bilingual Brussels and the German-speaking Community) are largely monolingual. The Netherlands and Belgium produce the vast majority of music, films, books and other media written or spoken in Dutch. Dutch is a monocentric language, with all speakers using the same standard form (authorized by the Dutch Language Union) based on a Dutch orthography employing the Latin alphabet when writing. In stark contrast to its written uniformity, Dutch lacks a prestige dialect and has a large dialectal continuum consisting of 28 main dialects, which can themselves be further divided into at least 600 distinguishable varieties. Outside the Netherlands and Belgium, the dialect around the German town of Kleve (South Guelderish) both historically and genetically belongs to the Dutch language. In North-Western France, the area around Calais was historically Dutch-speaking (West Flemish), of which an estimated 20,000 are daily speakers. The cities of Dunkirk, Gravelines and Bourbourg only became predominantly French-speaking by the end of the 19th century. In the countryside, until World War I, many elementary schools continued to teach in Dutch, and the Catholic Church continued to preach and teach the catechism in Dutch in many parishes. During the second half of the 19th century, Dutch was banned from all levels of education by both Prussia and France and lost most of its functions as a cultural language. In both Germany and France, the Dutch standard language is largely absent, and speakers of these Dutch dialects will use German or French in everyday speech. Dutch is not afforded legal status in France or Germany, either by the central or regional public authorities, and knowledge of the language is declining among younger generations. As a foreign language, Dutch is mainly taught in primary and secondary schools in areas adjacent to the Netherlands and Flanders. In French-speaking Belgium, over 300,000 pupils are enrolled in Dutch courses, followed by over 23,000 in the German states of Lower Saxony and North Rhine-Westphalia, and about 7,000 in the French region of Nord-Pas-de-Calais (of which 4,550 are in primary school). At an academic level, the largest number of faculties of neerlandistiek can be found in Germany (30 universities), followed by France (20 universities) and the United Kingdom (5 universities). Despite the Dutch presence in Indonesia for almost 350 years, as the Asian bulk of the Dutch East Indies, the Dutch language has no official status there and the small minority that can speak the language fluently are either educated members of the oldest generation, or employed in the legal profession, as certain law codes are still only available in Dutch. Dutch is taught in various educational centres in Indonesia, the most important of which is the Erasmus Language Centre (ETC) in Jakarta. Each year, some 1,500 to 2,000 students take Dutch courses there. In total, several thousand Indonesians study Dutch as a foreign language. Owing to centuries of Dutch rule in Indonesia, many old documents are written in Dutch. Many universities therefore include Dutch as a source language, mainly for law and history students. In Indonesia this involves about 35,000 students. Unlike other European nations, the Dutch chose not to follow a policy of language expansion amongst the indigenous peoples of their colonies. In the last quarter of the 19th century, however, a local elite gained proficiency in Dutch so as to meet the needs of expanding bureaucracy and business. Nevertheless, the Dutch government remained reluctant to teach Dutch on a large scale for fear of destabilising the colony. Dutch, the language of power, was supposed to remain in the hands of the leading elite. After independence, Dutch was dropped as an official language and replaced by Malay. Yet the Indonesian language inherited many words from Dutch: words for everyday life as well as scientific and technological terms. One scholar argues that 20% of Indonesian words can be traced back to Dutch words, many of which are transliterated to reflect phonetic pronunciation e.g. kantoor "office" in Indonesian is kantor, while bus "bus" becomes bis. In addition, many Indonesian words are calques of Dutch; for example, rumah sakit "hospital" is calqued on the Dutch ziekenhuis (literally "sickhouse"), kebun binatang "zoo" on dierentuin (literally "animal garden"), undang-undang dasar "constitution" from grondwet (literally "ground law"). These account for some of the differences in vocabulary between Indonesian and Malay. After the declaration of independence of Indonesia, Western New Guinea, the "wild east" of the Dutch East Indies, remained a Dutch colony until 1962, known as Netherlands New Guinea. Despite prolonged Dutch presence, the Dutch language is not spoken by many Papuans, the colony having been ceded to Indonesia in 1963. Dutch-speaking immigrant communities can also be found in Australia and New Zealand. The 2011 Australian census showed 37,248 people speaking Dutch at home. At the 2006 New Zealand census, 26,982 people, or 0.70 percent of the total population, reported to speak Dutch to sufficient fluency that they could hold an everyday conversation. In contrast to the colonies in the East Indies, from the second half of the 19th century onwards, the Netherlands envisaged the expansion of Dutch in its colonies in the West Indies. Until 1863, when slavery was abolished in the West Indies, slaves were forbidden to speak Dutch, with the effect that local creoles such as Papiamento and Sranan Tongo which were based not on Dutch but rather other European languages, became common in the Dutch West Indies. However, as most of the people in the Colony of Surinam (now Suriname) worked on Dutch plantations, this reinforced the use of Dutch as a means for direct communication. In Suriname today, Dutch is the sole official language, and over 60 percent of the population speaks it as a mother tongue. Dutch is the obligatory medium of instruction in schools in Suriname, even for non-native speakers. A further twenty-four percent of the population speaks Dutch as a second language. Suriname gained its independence from the Netherlands in 1975 and has been an associate member of the Dutch Language Union since 2004. The lingua franca of Suriname, however, is Sranan Tongo, spoken natively by about a fifth of the population. In Aruba, Bonaire, Curaçao and Sint Maarten, all parts of the Kingdom of the Netherlands, Dutch is the official language but spoken as a first language by only 7% to 8% of the population, although most native-born people on the islands can speak the language since the education system is in Dutch at some or all levels. In the United States, a now extinct dialect of Dutch, Jersey Dutch, spoken by descendants of 17th-century Dutch settlers in Bergen and Passaic counties, was still spoken as late as 1921. Other Dutch-based creole languages once spoken in the Americas include Mohawk Dutch (in Albany, New York), Berbice (in Guyana), Skepi (in Essequibo, Guyana) and Negerhollands (in the United States Virgin Islands). Pennsylvania Dutch is not a member of the set of Dutch dialects and is less misleadingly called Pennsylvania German. Martin Van Buren, the eighth President of the United States, spoke Dutch natively and is the only U.S. President whose first language was not English. Dutch prevailed for many generations as the dominant language in parts of New York along the Hudson River. Another famous American born in this region who spoke Dutch as a first language was Sojourner Truth. According to the 2000 United States census, 150,396 people spoke Dutch at home, while according to the 2006 Canadian census, this number reaches 160,000 Dutch speakers. At an academic level, 20 universities offer Dutch studies in the United States. In Canada, Dutch is the fourth most spoken language by farmers, after English, French and German, and the fifth most spoken non-official language overall (by 0.6% of Canadians). The largest legacy of the Dutch language lies in South Africa, which attracted large numbers of Dutch, Flemish and other northwest European farmer (in Dutch, boer) settlers, all of whom were quickly assimilated. The long isolation from the rest of the Dutch-speaking world made the Dutch as spoken in Southern Africa evolve into what is now Afrikaans. In 1876, the first Afrikaans newspaper called Die Afrikaanse Patriot was published in the Cape Colony. European Dutch remained the literary language until the start of the 1920s, when under pressure of Afrikaner nationalism the local "African" Dutch was preferred over the written, European-based standard. In 1925, section 137 of the 1909 constitution of the Union of South Africa was amended by Act 8 of 1925, stating "the word Dutch in article 137 ... is hereby declared to include Afrikaans". The constitution of 1983 only listed English and Afrikaans as official languages. It is estimated that between 90% to 95% of Afrikaans vocabulary is ultimately of Dutch origin. Both languages are still largely mutually intelligible, although this relation can in some fields (such as lexicon, spelling and grammar) be asymmetric, as it is easier for Dutch speakers to understand written Afrikaans than it is for Afrikaans speakers to understand written Dutch. Afrikaans is grammatically far less complex than Dutch, and vocabulary items are generally altered in a clearly patterned manner, e.g. vogel becomes voël ("bird") and regen becomes reën ("rain"). In South Africa, the number of students following Dutch at university is difficult to estimate, since the academic study of Afrikaans inevitably includes the study of Dutch. Elsewhere in the world, the number of people learning Dutch is relatively small. It is the third language of South Africa in terms of native speakers (~13.5%), of whom 53 percent are Coloureds and 42.4 percent Whites. In 1996, 40 percent of South Africans reported to know Afrikaans at least at a very basic level of communication. It is the lingua franca in Namibia, where it is spoken natively in 11 percent of households. In total, Afrikaans is the first language in South Africa alone of about 7.1 million people and is estimated to be a second language for at least 10 million people worldwide, compared to over 23 million and 5 million respectively, for Dutch. The Dutch colonial presence elsewhere in Africa, notably Dutch Gold Coast, was too ephemeral not to be wiped out by prevailing colonizing European successors. Belgian colonial presence in Congo and Rwanda-Urundi (Burundi and Rwanda, held under League of Nations mandate and later UN trust) left little (Flemish) Dutch legacy, as French was the main colonial language. For further details on different realisations of phonemes, dialectal differences and example words, see the full article at Dutch phonology. Voicing of pre-vocalic initial voiceless alveolar fricatives occurs, although less in Dutch than in German (Dutch zeven, German sieben with [z] versus English seven and Low German seven with [s]), and also the shift /θ/ → /d/. Dutch shares only with Low German the development of /xs/ → /ss/ (Dutch vossen, ossen and Low German Vösse, Ossen versus German Füchse, Ochsen and English foxes, oxen), and also the development of /ft/ → /xt/ though it is far more common in Dutch (Dutch zacht and Low German sacht versus German sanft and English soft, but Dutch kracht versus German Kraft and English craft). The realization of /r/ phoneme varies considerably from dialect to dialect and even between speakers in the same dialect area. Common realisations are an alveolar trill [r], alveolar tap [ɾ], uvular trill [ʀ], voiced uvular fricative [ʁ], and alveolar approximant [ɹ]. The realization of /ʋ/ also varies somewhat by area and speaker. The main realisation is a labiodental approximant [ʋ], but some speakers, particularly in the south, use a bilabial approximant [β̞] or a labiovelar approximant [w]. The lateral /l/ is slightly velarized postvocalically in most dialects, particularly in the north. /x/ and /ɣ/ may be true velars [x] and [ɣ], uvular [χ] and [ʁ] or palatal [ç] and [ʝ]. The more palatal realisations are common in southern areas, while uvulars are common in the north. Some northern dialects have a tendency to devoice all fricatives regardless of environment. This is particularly common with /ɣ/ but can affect others as well. /ʃ/ and /ʒ/ are not native phonemes of Dutch, and usually occur in borrowed words, like show and bagage (‘baggage’), but may occur in situations where /s/ and /z/ are palatalised. /ɡ/ is not a native phoneme of Dutch and only occurs in borrowed words, like garçon. Like English, Dutch did not develop i-mutation as a morphological marker and shares with most Germanic languages the lengthening of short vowels in stressed open syllables, which has led to contrastive vowel length that is used as a morphological marker. Dutch has an extensive vowel inventory. Vowels can be grouped as back rounded, front unrounded and front rounded. They are also traditionally distinguished by length or tenseness. Vowel length is not always considered a distinctive feature in Dutch phonology, because it normally co-occurs with changes in vowel quality. One feature or the other may be considered redundant, and some phonemic analyses prefer to treat it as an opposition of tenseness. However, even if not considered part of the phonemic opposition, the long/tense vowels are still realised as phonetically longer than their short counterparts. The changes in vowel quality are also not always the same in all dialects, and in some there may be little difference at all, with length remaining the primary distinguishing feature. And while it is true that older words always pair vowel length with a change in vowel quality, new loanwords have reintroduced phonemic oppositions of length. Compare zonne(n) [ˈzɔnə] ("suns") versus zone [ˈzɔːnə] ("zone") versus zonen [ˈzoːnə(n)] ("sons"), or kroes [krus] ("mug") versus cruise [kruːs] ("cruise"). The distinction between /i y u/ and /iː yː uː/ is only slight, and may be considered allophonic for most purposes. However, some recent loanwords have introduced distinctively long /iː yː uː/, making the length distinction marginally phonemic. The long close-mid vowels /eː øː oː/ are realised as slightly closing diphthongs [eɪ øʏ oʊ] in many northern dialects. The long open-mid vowels /ɛː œː ɔː/ only occur in a handful of loanwords, mostly from French. In certain Belgian Dutch varieties they may also occur as realisations of /ɛi œy au/. The long close and close-mid vowels are often pronounced more closed or as centering diphthongs before an /r/ in the syllable coda. This may occur before coda /l/ as well. Unique to the development of Dutch is the collapse of older ol/ul/al + dental into ol + dental, followed by vocalisation of pre-consonantal /l/ and after a short vowel, creating the diphthong /ɑu/ e.g., Dutch goud, zout and bout corresponds with Low German Gold, Solt, Bolt; German Gold, Salz, Balt and English gold, salt, bolt. This is the most common diphthong along with /ɛi œy/. All three are commonly the only ones considered unique phonemes in Dutch. The tendency for native English speakers is to pronounce Dutch names with /ɛi/ (written as ij or ei) as /aɪ/, (like the English vowel y) which does not normally lead to confusion among native listeners, since in a number of dialects (e.g. in Amsterdam) the same pronunciation is heard. In contrast, /ɑi/ and /ɔi/ are rare in Dutch, and occur only in some words. The "long/tense" diphthongs, while they are indeed realised as proper diphthongs, are generally analysed phonemically as a long/tense vowel followed by a glide /j/ or /ʋ/. All diphthongs end in a close vowel (/i y u/). They are grouped here by their first element. The syllable structure of Dutch is (C)(C)(C)V(C)(C)(C)(C). Many words, as in English, begin with three consonants; for example, straat /straːt/ (street). There are words that end in four consonants, e.g., herfst /ɦɛrfst/ 'autumn', ergst /ɛrxst/ 'worst', interessantst 'most interesting', sterkst /stɛrkst/ 'strongest', the last three of which are superlative adjectives. The highest number of consonants in a single cluster is found in the word slechtstschrijvend /ˈslɛxtstˌsxrɛi̯vənt/ 'writing worst' with 7 consonant phonemes. Similar is angstschreeuw /ˈɑŋstsxreːu̯/ (help·info) "scream in fear", with six in a row. A notable change in pronunciation has been occurring in younger generations in the provinces of Utrecht, North and South Holland, which has been dubbed "Polder Dutch" by Jan Stroop. These speakers pronounce ⟨ij/ei⟩, ⟨ou/au⟩, and ⟨ui⟩, which used to be pronounced as /ɛi/, /ɔu/, and /œy/, increasingly lowered, as [ai], [au], and [ay] respectively. In addition, the same speakers pronounce /eː/, /oː/, and /øː/ as the diphthongs [ei], [ou], and [øy] respectively, making this change an example of a chain shift. This change is interesting from a sociolinguistic point of view because it has apparently happened relatively recently, in the 1970s, and was pioneered by older well-educated women from the upper middle classes. The lowering of the diphthongs has long been current in many Dutch dialects, and is comparable to the English Great Vowel Shift, and the diphthongisation of long high vowels in Modern High German, which centuries earlier reached the state now found in Polder Dutch. Stroop theorizes that the lowering of open-mid to open diphthongs is a phonetically "natural" and inevitable development and that Dutch, after having diphthongised the long high vowels like German and English, "should" have lowered the diphthongs like German and English as well. Instead, he argues, this development has been artificially frozen in an "intermediate" state by the standardisation of Dutch pronunciation in the 16th century, where lowered diphthongs found in rural dialects were perceived as ugly by the educated classes and accordingly declared substandard. Now, however, in his opinion, the newly affluent and independent women can afford to let that natural development take place in their speech. Stroop compares the role of Polder Dutch with the urban variety of British English pronunciation called Estuary English. Among Belgian and Surinamese Dutch speakers and speakers from other regions in the Netherlands, this vowel shift is not taking place. Dutch is grammatically similar to German, such as in syntax and verb morphology (for a comparison of verb morphology in English, Dutch and German, see Germanic weak verb and Germanic strong verb). Grammatical cases have largely fallen out of use and are now mostly limited to pronouns and a large number of set phrases. Inflected forms of the articles are also often found in surnames and toponyms. Standard Dutch uses three genders to differentiate between natural gender and three when discerning grammatical gender. But for most non-Belgian speakers, the masculine and feminine genders have merged to form the common gender (de), while the neuter (het) remains distinct as before. This gender system is similar to those of most Continental Scandinavian languages. As in English, but to a lesser degree, the inflectional grammar of the language (e.g., adjective and noun endings) has simplified over time. When grouped according to their conjugational class, Dutch has four main verb types: weak verbs, strong verbs, irregular verbs and mixed verbs. Strong verbs are the second most numerous verb group. This group is characterised by a vowel alternation of the stem in the past tense and perfect participle. Dutch distinguishes between 7 classes of strong verbs with some internal variants. Dutch is known for its large group of 'half strong verbs' these have either a weak past tense and a strong participle or a strong past tense and a weak participle. Finally there are also strong verbs that don't neatly fit in any of the seven classes. The following table shows the vowel alternations in more detail. It also shows the number of roots (bare verbs) that belong to each class, variants with a prefix are excluded. In Dutch the irregular verbs are the least numerous, but most used verb forms. As in English, the case system of Dutch and the subjunctive have largely fallen out of use, and the system has generalised the dative over the accusative case for certain pronouns (NL: me, je; EN: me, you; LI: mi, di vs. DE: mich/mir, dich/dir). While standard Dutch has three grammatical genders, this has few grammatical consequences and the masculine and feminine gender are often merged into a common gender in the Netherlands but not in Belgium (EN: none; NL/LI: common and neuter; in Belgium masculine, feminine and neuter is in use). Modern Dutch has mostly lost its case system. However, certain idioms and expressions continue to include now archaic case declensions. The article has just two forms, de and het, more complex than English, which has only the. The use of the older inflected form den in the dative or accusative, as well as use of der in the dative, is restricted to numerous set phrases, surnames and toponyms. In contemporary usage, the genitive case still occurs a little more often with plurals than with singulars, as the plural article is der for all genders and no special noun inflection must be taken account of. Der is commonly used in order to avoid reduplication of van, e.g. het merendeel der gedichten van de auteur instead of het merendeel van de gedichten van de auteur ("the bulk of the author's poems"). Hij vertelde over zijn zoon en zijn vrouw. – He told about his son and his (own) wife. Hij vertelde over zijn zoon en diens vrouw. – He told about his son and the latter's wife. Analogically, the relative and interrogative pronoun wie ("who") has the genitive forms wiens and wier (corresponding to English whose, but less frequent in use). Dutch also has a range of fixed expressions that make use of the genitive articles, which can be abbreviated using apostrophes. Common examples include "'s ochtends" (with 's as abbreviation of des; "in the morning") and desnoods (lit: "of the need", translated: "if necessary"). The Dutch written grammar has simplified over the past 100 years: cases are now mainly used for the pronouns, such as ik (I), mij, me (me), mijn (my), wie (who), wiens (whose: masculine or neuter singular), wier (whose: feminine singular; masculine, feminine or neuter plural). Nouns and adjectives are not case inflected (except for the genitive of proper nouns (names): -s, -'s or -'). In the spoken language cases and case inflections had already gradually disappeared from a much earlier date on (probably the 15th century) as in many continental West Germanic dialects. Inflection of adjectives is more complicated. The adjective receives no ending with indefinite neuter nouns in singular (as with een /ən/ 'a/an'), and -e in all other cases. (This was also the case in Middle English, as in "a goode man".) Note that fiets belongs to the masculine/feminine category, and that water and huis are neuter. More complex inflection is still found in certain lexicalized expressions like de heer des huizes (literally, "the man of the house"), etc. These are usually remnants of cases (in this instance, the genitive case which is still used in German, cf. Der Herr des Hauses) and other inflections no longer in general use today. In such lexicalized expressions remnants of strong and weak nouns can be found too, e.g. in het jaar des Heren (Anno Domini), where -en is actually the genitive ending of the weak noun. Also in this case, German retains this feature. Dutch shares much of its word order with German. Dutch exhibits subject–object–verb word order, but in main clauses the conjugated verb is moved into the second position in what is known as verb second or V2 word order. This makes Dutch word order almost identical to that of German, but often different from English, which has subject–verb–object word order and has since lost the V2 word order that existed in Old English. An example sentence used in some Dutch language courses and textbooks is "Ik kan mijn pen niet vinden omdat het veel te donker is", which translates into English word for word as "I can my pen not find because it far too dark is", but in standard English word order would be written "I cannot find my pen because it is far too dark". If the sentence is split into a main and subclause and the verbs highlighted, the logic behind the word order can be seen. Main clause: "Ik kan mijn pen niet vinden "
Subclause: "omdat het veel te donker is "
"Kun jij je pen niet vinden?" (literally "Can you your pen not find?") "Can't you find your pen?" "Waarom kun jij je pen niet vinden?" ("Why can you your pen not find?") "Why can't you find your pen?" "Jij kunt je pen niet vinden?" ("You can your pen not find?") "You can't find your pen?" "Kun jij je pen niet vinden omdat het veel te donker is?" ("Can you your pen not find because it far too dark is?") "Can you not find your pen because it's far too dark?" -tje for ending in -h, -j, -l, -n, -r, -w, or a vowel other than -y: zoen → zoentje (kiss). A single open vowel is doubled when adding "-tje" would change the pronunciation: auto → autootje (car). -etje for ending in -b, -l, -n, -ng or -r preceded by a "short" (lax) vowel: bal → balletje (ball). Final consonant is doubled (except for -ng) to preserve the vowel's shortness. The diminutive suffixes -ke (from which -tje has derived by palatalization), -eke, -ske, -ie (only for words ending -ch, -k, -p, or -s), -kie (instead of -kje), and -pie (instead of -pje) are used in southern dialects, and the forms ending on -ie as well in northern urban dialects. Some of these form part of expressions that became standard language, like een makkie, from gemak = ease). The noun joch (young boy) has, exceptionally, only the diminutive form jochie, also in standard Dutch. The form -ke is also found in many women's given names: Janneke, Marieke, Marijke, Mieke, Meike etc. In Dutch, the diminutive is not merely restricted to nouns, but can be applied to numerals (met z'n tweetjes, "the two of us"), pronouns (onderonsje, "tête-à-tête"), verbal particles (moetje, "shotgun marriage"), and even prepositions (toetje, "dessert"). :64–65 Most notable however, are the diminutive forms of adjectives and adverbs. The former take a diminutive ending and thus function as nouns, the latter remain adverbs and always have the diminutive with the -s appended, e.g. adjective: groen ("green") → noun: groentje ("rookie"); adverb: even ("just") → adverb: eventjes ("just a minute"). Some nouns have two different diminutives, each with a different meaning: bloem (flower) → bloempje (lit. "small flower"), but bloemetje (lit. also "small flower", meaning bouquet). A few nouns exist solely in a diminutive form, e.g. zeepaardje (seahorse), while many, e.g. meisje (girl), originally a diminutive of meid (maid), have acquired a meaning independent of their non-diminutive forms. A diminutive can sometimes be added to an uncountable noun to refer to a single portion: ijs (ice, ice cream) → ijsje (ice cream treat, cone of ice cream), bier (beer) → biertje. Some diminutive forms only exist in the plural, e.g. kleertjes (clothing). There are two series of personal pronouns, subject and objects pronouns. The forms on the right-hand sides within each column are the unemphatic forms; those not normally written are given in brackets. Only ons and u do not have an unemphatic form. The distinction between emphatic and unemphatic pronouns is very important in Dutch. :67 Emphatic pronouns in English use the reflexive pronoun form, but are used to emphasize the subject, not to indicate a direct or indirect object. For example, "I gave (to) myself the money" is reflexive but "I myself gave the money (to someone else) " is emphatic. Like in English, Dutch has generalised the dative over the accusative case for all pronouns, e.g. Du me, je, Eng me, you, vs. Germ mich/mir dich/dir. There is one exception: the standard language prescribes that in the third person plural, hen is to be used for the direct object, and hun for the indirect object. This distinction was artificially introduced in the 17th century by grammarians, and is largely ignored in spoken language and not well understood by Dutch speakers. Consequently, the third person plural forms hun and hen are interchangeable in normal usage, with hun being more common. The shared unstressed form ze is also often used as both direct and indirect objects and is a useful avoidance strategy when people are unsure which form to use. Dutch shares also with English the presence of h- pronouns, e.g. Du hij, hem, haar, hen, hun and Eng he, him, her vs. Germ er, ihn, ihr, ihnen. Like most Germanic languages, Dutch forms noun compounds, where the first noun modifies the category given by the second (hondenhok = doghouse). Unlike English, where newer compounds or combinations of longer nouns are often written in open form with separating spaces, Dutch (like the other Germanic languages) either uses the closed form without spaces (boomhut = tree house) or inserts a hyphen (VVD-coryfee = outstanding member of the VVD, a political party). Like German, Dutch allows arbitrarily long compounds, but the longer they get, the less frequent they tend to be. The longest serious entry in the Van Dale dictionary is wapenstilstandsonderhandeling (help·info) (ceasefire negotiation). Leafing through the articles of association (Statuten) one may come across a 30-letter vertegenwoordigingsbevoegdheid (help·info) (authorisation of representation). An even longer word cropping up in official documents is ziektekostenverzekeringsmaatschappij (health insurance company) though the shorter ziekteverzekeraar (health insurer) is more common. Notwithstanding official spelling rules, some Dutch-speaking people, like some Scandinavians and German speakers, nowadays tend to write the parts of a compound separately, a practice sometimes dubbed de Engelse ziekte (the English disease). Dutch vocabulary is predominantly Germanic in origin, with loanwords accounting for 20%. The main foreign influence on Dutch vocabulary since the 12th century and culminating in the French period has been French and (northern) Oïl languages, accounting for an estimated 6.8% of all words, or more than a third of all loanwords. Latin, which was spoken in the southern Low Countries for centuries, and subsequently played a major role as the language of science and religion, follows with 6.1%. High German and Low German were influential until the mid-19th century and account for 2.7%, but these are mostly unrecognizable since many have been "Dutchified", e.g. German Fremdling → Dutch vreemdeling. From English Dutch has borrowed words since the middle of the 19th century, as a consequence of the increasing power and influence of Britain and the United States. The share of English loanwords is about 1.5%, but this number is still on the increase. Many English loans become less visible over time as they are either gradually replaced by calques (e.g., English loan skyscraper became Dutch wolkenkrabber) or neologisms (e.g., English loan bucket list became Dutch loodjeslijst). Conversely, Dutch contributed many loanwords to English, accounting for 1.3% of its lexicon. The main Dutch dictionary is the Van Dale groot woordenboek der Nederlandse taal, which contains some 268,826 headwords. In the field of linguistics, the 45,000-page Woordenboek der Nederlandsche Taal is also widely used. This scholarly endeavor took 147 years to complete and contains all recorded Dutch words from the Early Middle Ages onward. Dutch uses the digraph IJ as a single letter. 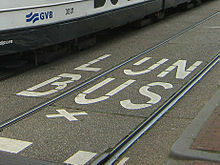 Shown is a bus road marking saying lijnbus. The official spelling is set by the Wet schrijfwijze Nederlandsche taal (Law on the writing of the Dutch language; Belgium 1946, Netherlands 1947; based on a 1944 spelling revision; both amended in the 1990s after a 1995 spelling revision). The Woordenlijst Nederlandse taal, more commonly known as "het groene boekje" (i.e. "the green booklet", because of its color), is usually accepted as an informal explanation of the law. Dutch is written using the Latin script. Dutch uses one additional character beyond the standard alphabet, the digraph IJ. It has a relatively high proportion of doubled letters, both vowels and consonants, due to the formation of compound words and also to the spelling devices for distinguishing the many vowel sounds in the Dutch language. An example of five consecutive doubled letters is the word voorraaddoos (food storage container). The diaeresis (Dutch: trema) is used to mark vowels that are pronounced separately when involving a pre- or suffix, and a hyphen is used when the problem occurs in compound words. For example; "beïnvloed" (influenced), but zee-eend (sea duck). Generally, other diacritical marks occur only in loanwords. However, the acute accent can also be used for emphasis or to differentiate between two forms, and its most common use is to differentiate between the indefinite article 'een' (a, an) and the numeral 'één' (one). Wikivoyage has a travel guide for Dutch phrasebook. ^ In France, a historical dialect called French Flemish is spoken. There are about 80,000 Dutch speakers in France; see Simpson 2009, p. 307. In French Flanders, only a remnant of 20,000 Flemish-speakers remain; see Berdichevsky 2004, p. 90. French Flemish is spoken in the north-west of France by an estimated population of 20,000 daily speakers and 40,000 occasional speakers; see European Commission 2010. A dialect continuum exists between Dutch and German through the South Guelderish and Limburgish dialects. In 1941, 400,000 Indonesians spoke Dutch, and Dutch exerted a major influence on Indonesian; see Sneddon 2003, p. 161. In 1941, about 0.5% of the inland population had a reasonable knowledge of Dutch; see Maier 2005, p. 12. At the beginning of World War II, about one million Asians had an active command of Dutch, while an additional half million had a passive knowledge; see Jones 2008, p. xxxi. Many older Indonesians speak Dutch as a second language; see Thomson 2003, p. 80. Some of the ethnic Chinese in Indonesia speak Dutch amongst each other; see Tan 2008, pp. 62–64, Erdentuğ & Colombijn 2002, p. 104. Dutch is spoken by "smaller groups of speakers" in Indonesia; see Bussmann 2002, p. 83. Some younger Indonesians learn Dutch as a foreign language because their parents and grandparents may speak it and because in some circles, Dutch is regarded as the language of the elite; see Vos 2001, p. 91. At present, only educated people of the oldest generation, in addition to specialists who require knowledge of the language, can speak Dutch fluently; see Ammon 2006, p. 2017. Around 25% of present-day Indonesian vocabulary can be traced back to Dutch words, see Maier 2005, p. 17. ^ 410,000 in USA, 159,000 in Canada, 47,000 in Australia; see Simpson 2009, p. 307. Between 200,000 and 400,000 in USA alone; see McGoldrick, Giordano & Garcia-Preto 2005, p. 536. Afrikaans is rooted in 17th century dialects of Dutch; see Holm 1989, p. 338, Geerts & Clyne 1992, p. 71, Mesthrie 1995, p. 214, Niesler, Louw & Roux 2005, p. 459. ^ It has the widest geographical and racial distribution of all official languages of South Africa; see Webb 2003, pp. 7, 8, Berdichevsky 2004, p. 131. It has by far the largest geographical distribution; see Alant 2004, p. 45. An estimated 40 percent of South Africans have at least a basic level of communication in Afrikaans; see Webb 2003, p. 7 McLean & McCormick 1996, p. 333. Afrikaans is a lingua franca of Namibia; see Deumert 2004, p. 1, Adegbija 1994, p. 26, Batibo 2005, p. 79, Donaldson 1993, p. xiii, Deumert & Vandenbussche 2003, p. 16, Baker & Prys Jones 1997, p. 364, Domínguez & López 1995, p. 399, Page & Sonnenburg 2003, p. 8, CIA 2010. While the number of total speakers of Afrikaans is unknown, estimates range between 15 and 23 million. Afrikaans has 16.3 million speakers; see de Swaan 2001, p. 216. Afrikaans has a total of 16 million speakers; see Machan 2009, p. 174. About 9 million people speak Afrikaans as a second or third language; see Alant 2004, p. 45, Proost 2006, p. 402. Afrikaans has over 5 million native speakers and 15 million second language speakers; see Réguer 2004, p. 20. Afrikaans has about 6 million native and 16 million second language speakers; see Domínguez & López 1995, p. 340. In South Africa, over 23 million people speak Afrikaans to some degree, of which a third are first-language speakers; see Page & Sonnenburg 2003, p. 7. L2 "Black Afrikaans" is spoken, with different degrees of fluency, by an estimated 15 million; see Stell & 2008–11, p. 1. Dutch and Afrikaans share mutual intelligibility; see Gooskens 2007, p. 453, Holm 1989, p. 338, Baker & Prys Jones 1997, p. 302, Egil Breivik & Håkon Jahr 1987, p. 232. For written mutual intelligibility; see Sebba 2007, p. 116, Sebba 1997, p. 161. It is easier for Dutch speakers to understand Afrikaans than the other way around; see Gooskens 2007, p. 454. ^ Dutch and English are the closest relatives of German; see Abraham 2006, p. 124. Dutch is the closest relative of German; see Czepluch & Abraham 2004, p. 13. Dutch and English are closely related; see Ingram 1989, p. 494, Todd 2004, p. 37, Kager 1989, p. 105, Hogg 2002, p. 134, De Bot, Lowie & Verspoor 2005, pp. 130, 166, Weissenborn & Höhle 2001, p. 209, Crisma & Longobarde 2009, p. 250. Dutch and English are very closely related languages; see Fitzpatrick 2007, p. 188. Dutch is, after Frisian, the closest relative of English; see Mallory & Adams 2006, p. 23, Classe 2000, p. 390, Hogg 2002, p. 3, Denning, Kessler & Leben 2007, p. 22. English is most closely related to Dutch; see Lightfoot 1999, p. 22, and more so than to German; see Sonnenschein 2008, p. 100, Kennedy Wyld 2009, p. 190. ^ Dutch is traditionally described as morphologically between English and German, but syntactically closer to German; see Clyne 2003, p. 133. Dutch has been positioned to be between English and German; see Putnam 2011, p. 108, Bussmann 2002, p. 83, Müller 1995, p. 121, Onysko & Michel 2010, p. 210. Typologically, Dutch takes a midway position between English and German, with a similar word order to that of German, grammatical gender, and a largely Germanic vocabulary. It is morphologically close to English, and the case system and subjunctive have largely fallen out of use; see Swan & Smith 2001, p. 6. ^ Dutch shares with English its simplified morphology and the abandonment of the grammatical case system; see Booij 1999, p. 1, Simpson 2009, p. 309. In contrast to German, case markings have become vestigial in English and Dutch; see Hogg 2002, p. 134, Abraham 2006, p. 118, Bussmann 2002, p. 83, Swan & Smith 2001, p. 6. The umlaut in Dutch and English matured to a much lesser extent than in German; see Simpson 2009, p. 307, Lass 1994, p. 70, Deprez 1997, p. 251. ^ Simpson 2009, p. 307, Booij 1999, p. 1 Dutch and German do not have a strict SVO order as in English; see Hogg 2002, pp. 87, 134. In contrast to English, which has SVO as the underlying word order, for Dutch and German this is SV1OV2 or (in subordinate clauses) SOV; see Ingram 1989, p. 495, Jordens & Lalleman 1988, pp. 149, 150, 177. Dutch has almost the same word order as German; see Swan & Smith 2001, p. 6. ^ Dutch vocabulary has more Germanic words than English and more Romance words than German; see Simpson 2009, p. 309, Swan & Smith 2001, p. 17. Dutch vocabulary is mostly Germanic; see Swan & Smith 2001, p. 6. Dutch has the most similar vocabulary to English; see Mallory & Adams 2006, p. 1. ^ a b c European Commission (2006). "Special Eurobarometer 243: Europeans and their Languages (Survey)" (PDF). Europa. Retrieved February 3, 2007. "1% of the EU population claims to speak Dutch well enough in order to have a conversation." (page 153). ^ a b "Dutch". Languages at Leicester. University of Leicester. ^ Hammarström, Harald; Forkel, Robert; Haspelmath, Martin, eds. (2017). "Modern Dutch". Glottolog 3.0. Jena, Germany: Max Planck Institute for the Science of Human History. ^ "Welke erkende talen heeft Nederland?" (in Dutch). Rijksoverheid. Retrieved December 27, 2017. ^ a b c "Het Nederlandse taalgebied" (in Dutch). Nederlandse Taalunie. 2005. Retrieved November 4, 2008. ^ "Netherlandic language – Encyclopædia Britannica". Britannica.com. Retrieved June 11, 2014. ^ Willemyns, Roland (2002). "Language Contact at the Romance-Germanic Language Border". In Jeanine Treffers-Daller, Roland Willemyns (ed.). Journal of multilingual and multicultural development. Multilingual Matters. p. 4. ISBN 1853596272. ^ "A Guide to Dutch – 10 facts about the Dutch language". Languages. BBC. 2014. ^ see also Haeringen, Coenraad van. Netherlancis Language Research Men and Works in the Study of Dutch. Brill. ^ Strabo, Walafridus (January 1, 1996). Walahfrid Strabo's Libellus De Exordiis Et Incrementis Quarundam in Observationibus Ecclesiasticis Rerum: A Translation and Liturgical Commentary. BRILL. p. 223. ISBN 9004096698. ^ a b DBNL. "Verslagen en mededelingen van de Koninklijke Vlaamse Academie voor Taal- en Letterkunde 1909 · dbnl". DBNL (in Dutch). Retrieved April 25, 2017. ^ see also Haeringen, Coenraad van. Netherlandic Language Research: Men and Works in the Study of Dutch. Brill. ^ (in Dutch) See J. Verdam, Middelnederlandsch handwoordenboek (The Hague 1932 (reprinted 1994)): "Nederlant, znw. o. I) Laag of aan zee gelegen land. 2) land aan den Nederrijn; Nedersaksen, -duitschland." ^ "Hermes in uitbreiding". Users.pandora.be. Retrieved August 12, 2015. ^ (in Dutch) neder- corresponds with the English nether-, which means "low" or "down". See Online etymological dictionary. Entry: Nether. ^ Willemyns, Roland (2013). Dutch : biography of a language. Oxford: Oxford University Press. pp. xiii. ISBN 0199858713. ^ "Languages of the World: Germanic languages". The New Encyclopædia Britannica. Chicago, IL, United States: Encyclopædia Britannica, Inc. 1993. ISBN 0-85229-571-5. This long-standing, well-known article on the languages can be found in almost any edition of Britannica. ^ Willemyns, Roland (2013). Dutch: Biography of a Language. Oxford University Press. pp. 40–41. ISBN 978-0-19-932366-1. ^ editor, Lister M. Matheson (2012). Icons of the Middle Ages : rulers, writers, rebels, and saints. Santa Barbara, Calif.: Greenwood. p. 145. ISBN 0313340803. ^ Besamusca, Emmeline; Verheul, Jaap. Discovering the Dutch: on culture and society of the Netherlands. Amsterdam University Press. p. 239. ISBN 9789048526093. ^ Full English transcript: BIBLE, that is: The entire H. Scripture, containing all the Canonical Books of the Old and the New TESTAMENTS. Now first, by order of the High LORDS STATES GENERAL of the United Netherlands, and according to the Decision of the National Synod, held at Dordrecht, in the Years 1618 and 1619. From the Original languages into our Dutch language faithfully translated. With new added Clarifications of the dark passages, notes of the paralleled Texts, and new Indexes of both TESTAMENTS. ^ "Dutch & Other Languages". Ccjk.com. Retrieved August 12, 2015. ^ "Taal in Nederland .:. Brabants". Taal.phileon.nl. Retrieved June 11, 2014. ^ McRae, Kenneth D. (1984). Conflict and compromise in multilingual societies. Waterloo, ON: Wilfrid Laurier University Press. pp. 54–55. ISBN 0889201951. ^ Friedrich Maurer uses the term Istvaeonic instead of Franconian; see Friedrich Maurer (1942), Nordgermanen und Alemannen: Studien zur germanischen und frühdeutschen Sprachgeschichte, Stammes- und Volkskunde, Bern: Verlag Francke. ^ Belgium (2005). Keith Brown (ed.). Encyclopedia of Language and Linguistics (2 ed.). Elsevier. ISBN 0-08-044299-4. ^ Willemyns, Roland (2013). Dutch: Biography of a Language. OUP USA. ISBN 0199858713. , p.10. ^ PhD, William F. Katz, (2013). Phonetics for dummies. Hoboken, N.J.: John Wiley & Sons Inc. p. 238. ISBN 1118505085. ^ "Netherlands Statistics population counter". www.cbs.nl. Retrieved May 6, 2017. ^ a b "Europeans and their Languages" (PDF). ec.europa.eu. European Union. Retrieved May 6, 2017. ^ "Current population of Belgium". countrymeters.info. Retrieved May 6, 2017. ^ "Website Dutch Language Union". taalunieversum.org (in Dutch). ^ a b c "Hoeveel studenten studeren er jaarlijks Nederlands aan universiteiten buiten het taalgebied?" (in Dutch). Nederlandse Taalunie. 2012. ^ a b "Hoe trots zijn wij op het Nederlands?". Taalunieversum.org. Retrieved August 12, 2015. ^ "Journal of Multilingual and Multicultural Development" (PDF). Multilingual-matters.net. Retrieved August 12, 2015. ^ "Flemish in France". Uoc.edu. Retrieved August 12, 2015. ^ a b c "Nederlands studeren wereldwijd". Taalunieversum.org. Retrieved August 12, 2015. ^ a b "Neerlandistiek wereldwijd". Neerlandistiek.taalunieversum.org. Retrieved August 12, 2015. ^ "Dutch worldwide". Taalunieversum. December 20, 2012. Retrieved August 12, 2015. ^ "Taalunie | Beleidsorganisatie voor het Nederlands". Taalunieversum.org. Retrieved August 12, 2015. ^ Joel Corneal Kuipers (1998). Language, identity, and marginality in Indonesia: the changing nature of ritual speech on the Island of Sumba. Cambridge University Press. p. 9. Retrieved June 29, 2010. ^ a b c "Westerse koloniale taalpolitiek in Azië: het Nederlands, Portugees, Spaans, Engels en Frans in vergelijkend perspectief" (PDF). Web.archive.org. October 1, 2013. Archived from the original (PDF) on March 25, 2009. Retrieved August 12, 2015. ^ Hendrik M. Maier (February 8, 2005). "A Hidden Language – Dutch in Indonesia". Institute of European Studies. Berkeley: University of California. ^ "Indonesia: Fight over the Papuans". TIME. December 29, 1961. Retrieved August 12, 2015. ^ "Census Home". Censusdata.abs.gov.au. Retrieved August 12, 2015. ^ "2006 Census Data – QuickStats About Culture and Identity – Tables". Statistics New Zealand. Archived from the original on May 17, 2016. Retrieved August 14, 2011. ^ "CIA – The World Factbook – Suriname". Cia.gov. Retrieved August 19, 2012. ^ "Documentaire". Taalunieversum. Retrieved August 12, 2015. ^ "About us". Taalunieversum.org. January 26, 2010. Retrieved August 12, 2015. ^ "Ethnologue on Sranan". Ethnologue.com. Retrieved August 19, 2012. ^ Recognition of Surinamese-Dutch (Surinaams-Nederlands) as an equal natiolect was expressed in 1976 by the publication of the Woordenboek van het Surinaams-Nederlands – een geannoteerde lijst van Surinaams-Nederlandse woorden en uitdrukkingen (Dictionary of Surinam Dutch – an annotated list of Surinam-Dutch words and expressions), see Johannes van Donselaar Woordenboek van het Surinaams-Nederlands – een geannoteerde lijst van Surinaams-Nederlandse woorden en uitdrukkingen, Utrecht : Instituut A. W. de Groot voor Algemene Taalwetenschap van de Rijksuniversiteit te Utrecht (1976), Amsterdam, E.T.Rap (1977) ISBN 90-6005-125-4, published in 1989 as the Woordenboek van het Surinaams-Nederlands (Dictionary of Surinam Dutch), by Van Donselaar, and later by the publication of the Woordenboek Surinaams Nederlands (Dictionary Surinam Dutch) in 2009 (editor Renata de Bies, in cooperation with lexicologists Willy Martin en Willy Smedts), which was previously published as the Woordenboek van de Surinaamse Bijdrage aan het Nederlands (Dictionary of the Surinam Contribution to Dutch"). ^ "CIA – The World Factbook – Aruba". Cia.gov. Retrieved August 19, 2012. ^ "Jersey Dutch". Bartleby.com. Retrieved August 19, 2012. ^ "German Myth 7 – Pennsylvania Dutch or German?". German.about.com. April 10, 2012. Retrieved August 19, 2012. ^ "Dutch". Mla.org. Retrieved August 12, 2015. ^ "Statistics Canada 2006 (Dutch and Flemish grouped together)". 2.statcan.ca. July 4, 2011. Retrieved August 19, 2012. ^ "Agriculture-population linkage data for the 2006 Census. The Daily". Statcan.gc.ca. December 2, 2008. Retrieved August 19, 2012. ^ Statistics Canada, 2006 Census Profile of Federal Electoral Districts (2003 Representation Order): Language, Mobility and Migration and Immigration and Citizenship. Ottawa, 2007, pp. 6–10. ^ a b c Language Standardization and Language Change: The Dynamics of Cape Dutch. Ana Deumert. John Benjamins Publishing Company. 2004. Retrieved November 10, 2008. ^ a b Standaard Afrikaans (PDF). Abel Coetzee. Afrikaner Pers. 1948. Retrieved September 17, 2014. ^ Abel Jacobus Coetzee (1940). Die verhaalskat van Ons Klyntji (1896–1905) (in Afrikaans). Johannesburg: Voortrekkerpers. OCLC 63430958. ^ "South Africa: Legislation: 1910–2015". Archontology.org. Retrieved August 12, 2015. ^ Language and Social History: Studies in South African Sociolinguistics (page 214). Rajend Mesthrie. New Africa Books. 1995. Retrieved November 3, 2008. ^ The Dutch Language: A Survey (page 132). Pierre Brachin, Paul Vincent. Brill Archive. 1985. Retrieved November 3, 2008. ^ "Oxford Journal on Mutual Comprehensibility of Written Afrikaans and Dutch". Llc.oxfordjournals.org. August 27, 2006. Retrieved August 19, 2012. ^ Name (Required): (August 14, 2012). "The Afrikaans Language". Kwintessential.co.uk. Archived from the original on September 7, 2012. Retrieved September 21, 2016. ^ "LANGUAGE POLICY DEVELOPMENT IN SOUTH AFRICA" (PDF). Archived from the original (PDF) on December 9, 2003. Retrieved September 21, 2016. ^ "The World Factbook (CIA) — Namibia". Cia.gov. Retrieved August 19, 2012. ^ Language Attitudes in Sub-Saharan Africa: A Sociolinguistic Overview (page 26). Efurosibina E. Adegbija. Multilingual Matters. 1994. Retrieved November 10, 2008. ^ "Ethnologue on Afrikaans". Ethnologue.com. Retrieved August 19, 2012. ^ "Onderzoek naar de volkstaal in de Jordaan". www.tussentaalenbeeld.nl. ^ Stroop, Jan (October 1999). "Young Women's Farewell to Standard Dutch". Poldernederlands. Retrieved January 2, 2010. ^ Decoster & Smessart, Wivine & Hans (2012). Basisbegrippen Fonetiek en Fonologie. Leuven: Acco. p. 91. ISBN 978-90-334-8576-3. ^ "History of the Dutch Language: Language change in the 19th and 20th century". Neon.niederlandistik.fu-berlin.de. Retrieved August 19, 2012. ^ "Grammatical Cases in Dutch". Zeer Goed Dutch. Retrieved August 12, 2015. ^ "Verb Movement in Old and Middle English: Dialect Variation and Language Contact". Ling.upenn.edu. January 20, 1995. Retrieved August 19, 2012. ^ a b c Donaldson, Bruce (2008). Dutch: A Comprehensive Grammar. Routledge. ISBN 9781134082360. ^ "Hun of hen?". Onze Taal Taaladviesdienst. Retrieved May 23, 2007. ^ "SOS – Signalering Onjuist Spatiegebruik". Spatiegebruik.nl. Retrieved August 12, 2015. ^ Loanwords in the World's Languages: A Comparative Handbook. Walter de Gruyter. 2009. p. 349. ^ Loanwords in the World's Languages: A Comparative Handbook. Walter de Gruyter. 2009. p. 352. ^ Loanwords in the World's Languages: A Comparative Handbook. Walter de Gruyter. 2009. p. 370. ^ "Home | Van Dale" (in Dutch). Vandale.nl. Retrieved August 12, 2015. This page was last edited on 17 April 2019, at 19:55 (UTC).